MASSIVE VOODOO: Tutorial - What colours to use? after i often find my spirituality in the beauty of colours i have decided to leave some words of them in here. About what colours i use for painting and which different use they have to me. Make experiments - if you are intrested in a colour while browsing your shop, buy it if you can and test around if you like it or not. That is how experiencesare made. 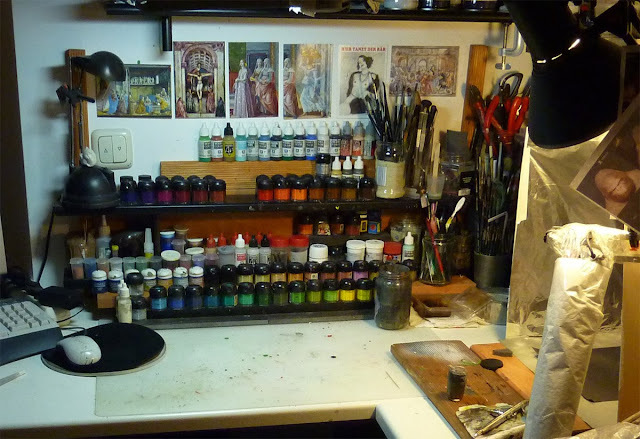 I thought the easiest way to show you is to take a picture of my lately cleaned workbench. As i am able and also have the need to have a fixed working place i always have my colours in front of me. Normally i did sort them about what fits together by their names. After all i decided otherwise yesterday, similiar but different. Personnaly i don't favor any brand of colours. I mostly use acrylic colours for painting up my miniatures. I have not yet managed to spread out for Oil colours. I have the plan everyday but getting some quality stuff i would need for this idea would easily be to expensive at the moment and somehow this moment is always, haha. I do dislike some from the experience i have made with them, please notice that this is my simple point of view and must not mean that you have to dislike them too. At my workbench you won't find a lot of the Vallejo's Game Colour range as i really had my problems with them while painting the way i do, for example making thin glazes of them didn't really work at all. I have a lot of the Citadel Colours from Games Workshop as i did start my hobby with them. The normal colours of this brand (i don't mean the Citadel Washes or Foundation colours) - the normal ones - i have the most as i am doing mostly of my painting with this acrylic colours. The 'normal' Games Workshop colour range is used by me for everything of my painting. From basecoating, glazing or bringing highlights in. For glazing they are perfect to me as you really can thin them down with water to make really soft glazes and the colours don't change while bringing a lot of water in. For example the Game Colour range of Vallejo always kills the colour and the medium it when bringing in too much water. Make some experiments if you don't believe me and get your own feeling for it. The Foundation colour range is used when i want something being covered very fast, sometimes for basecoating as their pigments are way more intensive. Don't use them much for glazing, often they are used upon a base to bring some heavy colours in for the basecoat. The Citadel Washes are used for washing sometimes. They are not shown on the picture as they stand behind the upper line of red and purple tones. Got mostly everyone of them and i like to work mostly dirty stuff with them, like bringing depth and colour variations on a Science Fiction base. I often use them by mixing them together with the 'normal' colours, then i do some glazes with this mix. It feels i can use the liquidness of the washes, their big thumbs up mixed to get way more variations. Also they are used often by me while working on metallics. I have some of them and do like them also very much. I often use them to get some intense tone as the pigments are much stronger in them as they are in the Citadel's range. Sometimes, when i am ordering new miniatures i buy some more of them to get them stocked up. Their range is really big and colourful. What i really think is great are their bottles. You may easily check the amount of colour coming out, in my eyes better than those of Citadel where i have to punch a brush in. I use the bright tones of this brand often to set in the final lights when i want them to pop out more than the gentle shadow work i had done before with the Citadels range. Sure they have also some special colours, like glazes or washes. Same use as mentioned above. Really like their metal tones to work with. I use their gloss varnish very often, as i didn't find another product that did satisfy me in the past like this did. The range is filled with 'special' colours or painting mediums, like for example the Mascara Liquida, what you can do with this is shown here. More about such special things, like Smoke for example will arrive in the future of the article section. This range of colour is mostly the same like described above. Big difference is that the tones are mostly very natural for the more realistic historical painting use. Got not much, but someday i will get some more. Those i have not yet, which are a lot are mixed by myself in funny experiments, haha. Sometimes i work with an Airbrush and thought about trying those out. I got 2 of them already, wow, yeah i know. They are good to work with an airbrush because they are already thinned. For painting with a brush i only use them sometimes for making thin glazes. Not much experience gained so far with those. I use their matt varnish and satin varnish very often, as i didn't find another product that did satisfy me in the past like they did. I got only small experience with those lately. They are completly different to acrylic colours as they are based on a mix of alcohol. Love the Tamyia Clear line, for example maxing blood and ugly strings. You can also do this with clear green, clear yellow and so on.Also glazing can be fun with them as the end result will stay a bit shiny in the end, not matt at all. Try them out. I will collect some more experience in the future i hope, for sure with other colours from their range. I got the skin painting set by Andrea which consists of six different tones. Love to work with them. Easy to handle, i guess the other Sets too. What i like about these sets is the fact that they are somehow equal to the Vallejo Colours by their use and handle but bring you all the colours you need for specific work in one colour, for example the blue, white or black paint set. Be sure that this area will be expanded sooner or later. I got a lot of them standing around, a so called little collection. How i use them will soon be up in form of an article and will be linked here. Keep an eye out on this post if you are intrested. I got a couple of those for using them mostly as washes while painting metals. For the moment this Tutorial is done. 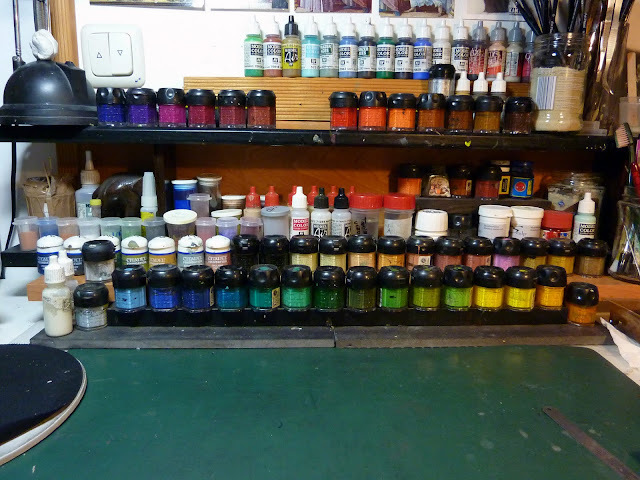 I will add some more explanations of colour materials that sorround my workbench like acrylic painting medium, thinner, drying extensioners and stuff standing around here. 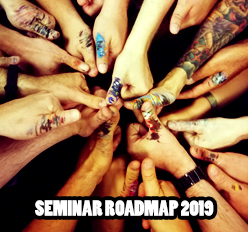 If you got some questions about this topic please let me know in form of a comment. There are 12 Kommentare for Tutorial - What colours to use? Hi Roman, try Revel AquaColor (Acrylics, too - they are very nice. What brush you are using mostly, company and size? Somebody knows about the PENTEL Poster Color acrylique paint? but i dont know if this paint is good or not. And i see nothing about that on internet too. Nice little read here. I saw it from facebook. I read it before but it was good to read again with baby asleep in bed and my wife out of town, can really go through and digest some of your writing. Funny thing, is I've found that I really like different paints for different things, but mostly I also prefer Citadel paints. I'm trying to work more on how I use color on the model, still lots to learn and I don't know if the fact that I am color-blind makes it more of a challenge. Vallejo Model color is good, but I don't know if I like the finish. It's very matte. Citadel colors have a slightly different finish that is softer or maybe more satin. Don't know how much this matters though, as I am frequently using a gloss varnish in the end and then spraying the model with dull coat. Inks do this very gloss finish sometimes as well. I find I really like inks. I grew up with them and now I find that I really treasure my old citadel range of inks of purple, blue, chesnut and black...even yellow I really like. So yes, just some random thoughts on the first day of year. Don't forget to click around my blog to see what I am working on, Always love good advice and criticism. I'll go check yo blog soon! have ever tried p3 paints or reaper paints at all.